Developing a starter begins with making a culture. A culture is created when flour and water are combined, and the microorganisms–wild yeast and bacteria present in the flour, in the air, and on the baker’s hands–begin to ferment spontaneously. […] Mix 5 pounds of bread flour–half white and half whole wheat. […] Fill a small, clear blowl halfway with lukewarm water. Add a handful of the 50/50 flour blend to the water and mix with your hands to achieve the consistency of a thick batter with no lumps. […] Cover the bowl with a kitchen towel and place in a cool, shaded spot for 2 to 3 days. […] After 2 or 3 days, check the culture to see if any bubbles have formed around the sides and on the surface. […] To feed the culture, discard about 80 percent of it. Replace the discarded portion with equal amounts of water and the 50/50 flour blend. Mix to combine just as you did in step 1. You have now begun training your culture into a starter. Day One Mix 50g/6 tablespoons white or wholemeal/wholewheat flour and 50g/3 1/2 tablespoons water together in a big bowl. Cover and leave on the counter for 24 hours. Day Two Add 50g/6 tablespoons white or wholemeal/wholewheat flour and 50g/3 1/2 tablespoons warm water to mix. Stir and cover. Leave for 24 hours. Day Five You starter should be bubbly. Congratulations! If your starter is not bubbly by the morning of Day Five, don’t add any more flour, just cover it and let it sit for another 24 hours. If nothing has happened by then, your house could be too clean. Seriously! Stop using bleach or other antiseptic sprays on every surface. Revert to hot, soapy water to clean surfaces. 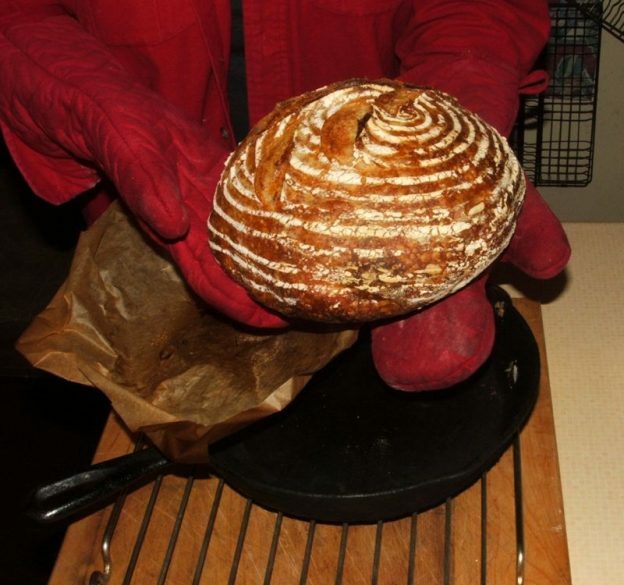 You need germs and so does your sourdough! If you run out or if you kill [your starter], it is not the end of the world. You can make more in 5 days. To refresh the starter when you need it, simply follow the instructions in the recipe. The recipes in this book assume you will store your starter in the refrigerator and that it will need refreshing. To that end they build in refreshment time and you get used to planning this in advance. My reasoning: It couldn’t possibly be overly sour now that I’m armed with new knowledge. Could it?? -me, 1st Attempt at Tartine Bread: Looks good, doesn’t it? Except I’m not very good at listening for the timer bell. The first resting period after mixing the pre-dough (before adding the salt) was closer to an hour than the recommended 40 minutes. Or was it an hour and a half? Also this time around, there is something I don’t remember happening at all. When folding and turning the dough, it began to feel as if it had been oiled! The dough felt beautifully smooth and silky. It was remarkable. Shaping was easy. But I’m afraid I skipped the bench rest – I really can’t be expected to remember all of those 26 pages…. So shoot me. If the bread hadn’t turned out so well, I swore that next time, I’d include the bench rest. But, really, I cannot imagine how this loaf could turn out any better! Two times in a row. Using the bench knife and one hand, work each piece of dough into a round shape. Tension builds when the dough slightly anchors to the work surface while you rotate it. By the end of the shaping, the dough should have a taut, smooth outer surface. You want to develop a strong tension in as few movements as possible—used decisive yet gentle force while handling the dough. If the surface rips, you have gone too far in developing tension. Don’t worry if it does rip—this is just an indication you should stop shaping and let the dough relax. 7) After this initial shaping, let both rounds of dough rest on the work surface for 20 to 30 minutes. This stage is called the bench rest. Make sure the dough is not exposed to drafts, which will cool it too much. […] During the bench rest, each round will relax and spread into a thick pancake shape. The edge around the circumference should appear fat and round, not flat and tapered or “dripping” off the edge. If […] the dough is spreading too much, these are indications that the dough did not develop enough tension during the bulk fermentation. To correct this, simply shape each round a second time. Hmmmm, maybe I’ll try applying a bench rest next time after all…. Below is the second recent success making Tartine bread this year. The ears from the scoring aren’t quite as dramatic as on the first loaf, but they’re still thrilling to see. leavener: On the day before baking the bread, put the leavener ingredients into a medium-sized bowl and using a wooden spoon, mix everything until all the flour is incorporated. Leave 100 gm in the bowl. Mix the extra into the jar in the fridge – this refreshes the starter. Cover the bowl with the 100gm with a plate and leave on the counter (or in the oven with only the light turned on) until it becomes bubbly and frothy like mousse (8-10 hours). mixing the pre-dough: When a small spoonful of the above floats in a small bowl of room temperature water, you can go ahead and mix the pre-dough. Put all the pre-dough ingredients, including the now bubbling leavener, into a large mixing bowl. Mix as well as you can, using your dough whisk (use a wooden spoon if you don’t have a whisk), until all the flour is incorporated. Cover the bowl with a plate and leave on the counter to rest for about 40 minutes. Chad Robertson says Do not skip the resting period. Working with the nature of the dough, the resting period allows the protein and starch in the flour to absorb the water, swell, and then relax into a cohesive mass. prepare the brot-form: Put rice flour into a brotform and distribute it as evenly as possible. (If you don’t have a brot-form, you can line a bowl, basket or sieve with parchment paper. You can also use a liberally rice floured tea towel (but then you have to deal with a floured tea towel once the bread is baked). If you do not have rice flour, you can use wheat flour. However, it makes it more difficult for the bread to be released from the basket. shaping: Scatter a dusting of wheat flour on the board and gently place the dough on the flour. Using wet hands, stretch the dough into a longish rectangle, then fold it like a letter, gently patting off any extra flour that might be there. Continue folding until the dough is shaped in a ball. Place it seam side UP in the well floured (rice) brot-form. Loosely wrap the basket and bread with a clean tea towel and enclose the whole thing inside a plastic bag and leave on the counter for 1 hour. Then refrigerate it for about 12 hours (or overnight). baking: First thing the next morning, take the shaped bread out of the fridge. Unwrap it and gently but firmly press your finger on the side of the bread. If the dough springs back immediately, recover it with the plastic bag and leave it on the counter. If the dough gradually returns back after being pressed, put the cast-iron frying pan and stainless steel bowl into the oven and preheat all to 425F. About fifteen minutes later, put a square of parchment paper on the counter (the paper should be large enough to cover the bottom and sides of the frying pan). Overturn the shaped bread onto the parchment paper. Using a lame (or scissors, or serrated knife), score the bread. Take the pan and bowl out of the oven (wear oven mitts!!) and place the frying pan on the stove (to prevent burning your countertop…). Transfer the bread to the middle of the frying pan and immediately put the stainless steel bowl overtop like a hat. Put everything into the oven and immediately turn it down to 400F. Bake for 30 minutes. Remove the hat and bake for a further 30 minutes or so, until the crust is a nice dark brown and the bread sounds hollow when tapped on the bottom. cooling: When the bread is done, remove it from the pan and allow it to cool on a footed rack before slicing and eating; the bread is still baking internally when first removed from the oven! If you wish to serve warm bread (of course you do), reheat it after it has cooled completely: To reheat any uncut bread, turn the oven to 400F for 5 minutes or so. Turn the oven OFF. Put the bread into the hot oven for about ten minutes. This will rejuvenate the crust and warm the crumb perfectly. :: salt: I urge you to weigh the salt. For more raving about this, please see Salt is salt, right? Sift the whole-wheat flour into the mixing bowl. (Set the bran aside for another use – put it into granola, or biscuits….) Replace the missing bran with wheat germ. There are so many things about this bread to be thrilled about! The oven spring. The shiny holes in the crumb. But most of all, the complete lack of sour flavour. At last! The other day, our brilliant neighbour handed her mother’s large Le Creuset casserole dish over the fence, saying that we could have it on almost permanent loan because they already had one just like it. So. Next time, I’ll try baking two loaves. It will be interesting to see what, if any difference, there is between Le Creuset and stainless steel bowl hat baking. How lovely that all the pets in our kitchen are so well behaved. This bread is perfection!!! Congratulations! Thank you, Karen! We’re so thrilled that the recipe is finally working for us. The only downside is that we can’t stop eating bread!